Opening Ceremony Experience…from on the field! My cousin Chris (pictured in costume below on the right) had the awesome opportunity of being one of the participants in the 2012 London Olympics Opening Ceremony last Friday night!! He was in the ‘Pandemonium’ scene near the beginning and sent out a cool email Sunday sharing some of his experiences. I enjoyed it so much and thought you might too so asked him if he’d mind if I shared it with you. He was happy to so I now give you his email. Thanks Chris! Well, I didn't get caught on camera during the Opening Ceremony but it was a wonderful experience to be part of it. After three months of rehearsals, trekking out to a disused parking lot next to the Ford factory on the outskirts of London and standing for hour after hour in the rain, we managed to pull off Danny Boyle's vision on the Industrial Revolution. Apparently our segment was the most expensive part of the $40 million dollar show and, during a rehearsal in the stadium itself, he explained to us why this part of the show was so important to him. "The Industrial Revolution changed the world like no other moment in history. I am willing to argue that point with anyone. Even the fact that I can read and write today is a result of it. But it was monstrous. These people built themselves a hell and then they had to live in it. Even today we are still feeling its impact on the global environment. But these people created great cities. And it is in great cities that we are able to come together and celebrate something like the Olympic Games." It was a pep talk we were in need of while facing another day of lifting sogging wet and muddy turf under the pouring rain. This is also why he chose to call this section of the show Pandemonium. I didn't know that the word 'pandemonium' was invented by John Milton as the name of the capital city of Hell in his epic poem Paradise Lost. But part of this amazing experience was the unwavering spirit of all the volunteers. Yes, nerves got frayed and people were tired and arguments happened. Still, the focus on doing the hard work and achieving the end result remained firm. In my little group there were people from Mexico, Taiwan, New Zealand, Trinidad, Jamaica and South Africa. The Brits among us were also travelling long distances to be there; one was coming from Liverpool and paying the train fares and hotel costs from his own pocket just to be a part of it. My little group contained a travel agent, an accountant, someone who works for the government on environmental issues, an ex-Royal Air Force pilot, a glass artist, a fraud investigator and an immigration officer. And what a terrific group of people they are. I will miss them all. We had had a couple of dress rehearsals in from of an invited audience of 40,000 people each night. Every time they made last minute changes. Even as we were just about to walk out on Friday night again we were told by our mass movement team leader, "there have been a few changes." It became a catch phrase for the whole event. On the night, with 80,000 people in the stadium, including one of the biggest ever gatherings of heads of state and VIPS, as well as a television audience estimated to be somewhere between 1-4 billion people, the adrenaline was running high. We really had no idea from the ground how our bit of the show would look. To be honest, I had just about forgotten how spectacular the towers coming up from the floor are as we had become so used to them in rehearsals. The moment of stillness to remember the soldiers from the wars was always a touching moment. Then, as the lead was pouring down the troughs and the central ring was forged with the drummers all around us and up on the tor the atmosphere took on the feeling of a primal ritual to bring the rings into existence. It was as if the drums were willing the rings to raise up and float above the stadium drawing them together with a primitive magic. Then the moment the pyro shower begins and the fire rains down. It was so moving to be there so close standing under it. Wonderful that I had the honour of being there to experience three times (including the dress rehearsals). Just breath taking. Something I will never forget. Hope you enjoyed it. I am pleased that lots of people seem to think our section was the best bit. I think Danny Boyle was trying to push the government to continue investing in the National Health Service by showcasing it to the world. There is a quote in the program which reads, "No society can legitimately call itself civilised if a sick person is denied medical aid because of lack of means". Then there was the Thanks Tim section. Probably the most polarising. The younger crowd loved it and the older crowd found it a too long. It wasn't made clear until the end that it was all in honour of Sir Tim Berners-Lee who invented the world wide web. He still works as a professor at Southampton university. But here is another moment in history, albeit recent history, which has revolutionised the way we live and even the way we conduct our relationships. I can thank Tim that you are reading this email. My dreams of working with an Oscar winning film director somehow never included carrying wet sheep poo covered turf. And when I auditioned to do the Opening Ceremony I could never have imagined that this would be the role I would play before a live TV audience of billions. But I am very grateful to have been there and proud of what we achieved. Now I'm looking forward to another week off work next week to go out and enjoy the Olympics and soak up the energy and excitement of being in the host city. Hope you will enjoy the games too. Thanks so much Chris! Enjoy the Olympics and the fun of living in the host city! Hope to see you next time you’re visiting Canada. I’m trying out a new commenting program called Disqus to help me out with something. So far I’ll admit that I’m not overly thrilled by what I have installed. I made a couple of changes tonight so hopefully those of you who have been unable to leave comments should now be able to do so. Please email me (see side bar) if you are still unable to comment. You will help me decide if I keep this or send it packing. Thanks for your patience as I work through this! Olympic Excitement is in the Air! I’ll admit it….I’m a HUGE fan of the Olympics! I love what they stand for: Unity, fun, dedication, hard work and healthy competition. As I sit here watching the Opening Ceremonies I can’t help but be in awe as I watch the nations gather peacefully, side by side. What an awesome opportunity is offered to us every 2 years as the world comes together for the Olympic games! I fondly remember watching Nadia Comaneci in the 1976 Olympics held in nearby Montreal. I had dreams of somehow competing for Canada in 1980! Heh…considering I was never an athlete I now wonder how that was going to happen but I guess that dream goes along with the one where I was going to marry a price after watching Charles and Diana wed. LOL! I guess I just dreamed big! Gotta love childhood dreams! I hope Hannah dreams big and I have a feeling with her spunky personality she’ll do just that! Tonight as I watch the ceremonies there is a sense of excitement in the air as one of my cousins who lives in London is part of the cast! I wasn’t able to see him on TV amidst the crowds (he was part of the first portion depicting the industrial revolution) but just knowing he was there, experiencing this once in a lifetime event in person had me so excited for him! Way to go Chris!! The parade of nations is always exciting! I couldn’t help myself as the Canadian athletes entered the stadium and I sat here with a huge smile and applauded. Super excited to see what Canada will do these games! One of the girls in Hannah’s gym is competing in artistic gymnastics. It’s neat to think that the young gal I watch practice week after week while Hannah is in her class is there representing our great country along with one of the coaches from our gym! Cool!! One moment that surprised me a bit but in a good way was the overwhelming feeling of pride and thankfulness that filled me when the Chinese athletes entered the stadium! 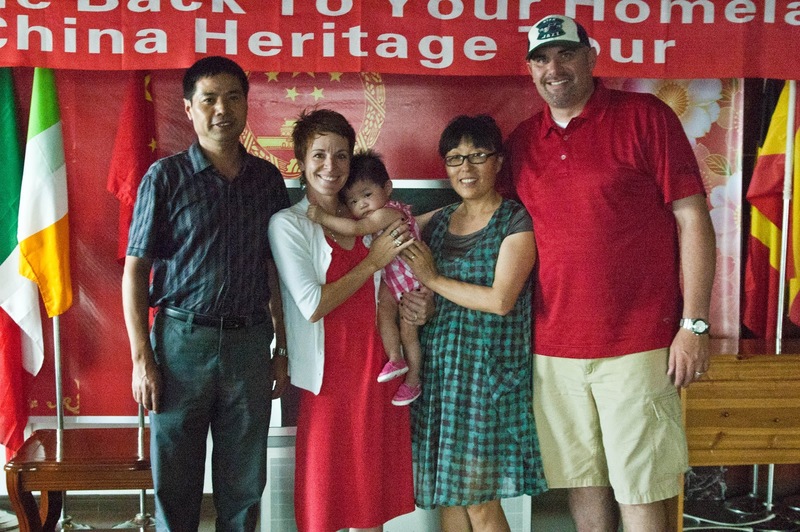 I burst into tears as I am still humbled and thankful that China blessed me with one of their own and allowed Hannah to come to Canada so that we can be a family!! I hope this feeling never, ever leaves! The last time the Summer Olympics were held it was the summer of 2008 and they were in Beijing. I remember thinking often that Hannah was probably already born and was there the same time as the Olympics were happening. Little did I know that God would allow her to be so very young and not be born until the following February! I hope you take time to enjoy some of the Olympics over the next 2 weeks. Cheer on the athletes who have prepared for years for this very moment! Hannah and I? We’ll be cheering for Canada and China! Heh…Look at my little pumpkin! This picture was taken Saturday November 14th, 2009 when she was just 8 months old. This is the day that she woke up as a Chinese citizen and went to sleep as a Canadian citizen after we travelled home to Canada. A momentous day for sure! Congratulations Tawni and John!!! Hannah and I couldn't be more thrilled for you!!! Hop on over and congratulate this amazing couple on the safe arrival of their sweet baby girl!! Hannah and I had the privilege of visiting this precious family in July of 2010 and now we celebrate the arrival of their precious baby girl, Hope! God is SO good!!! Hannah was excited to spend time at Hoppers with her cousin Makenna each morning and evening while we were at the cottage. Sometimes Mommy went to chapel and other times I enjoyed the free time to rest, blog and read. Friday after morning chapel the kiddos came in with their counsellors and shared some of what they had learned that week. The girls did so well and both enjoyed singing on stage. This video makes me giggle as Hannah is a beat behind everyone else. So cute!! Noah was there with his class too. What a sweetie my little nephew is! There are lots of activities that families can participate in. This week my brother Dave’s family won the scavenger hunt and Justin also won for the largest fish caught that week. Way to go! After we left the chapel the older kids were able to launch the rockets they’d been making in their group during the week. Even after how high it flew Josh was able to find his when it came down! It was great spending time with you at the cottage Dave, Trish and family! Let’s do it again next year! Swimming at the Cottage = Great Family Fun! Along with my parents, my brother and his family were also up at Muskoka Bible Centre earlier this month and we had so much fun together! From the time we arrived, we’d all meet at the beach in the afternoons for lots of swimming, sand castle building and fun family visits. In the past I’d seen many friends and their families enjoying family time together at MBC and this year it was so neat that it was our family spending this time together! On the last day that we were all together Rebecca and Victoria joined us too. What happens after an afternoon of fun, sun and swimming? And mommy thought she had a really good idea! It’s a bit after 11pm and I’m working on returning some emails and doing a catch up vacation post for the blog. Hannah just woke up so I went up to her. She looked up at me and with a big smile just said, ‘Mommy’ and patted my side of the bed. It was so sweet and it brought back SO many memories. I’d forgotten that when she was a baby and not yet talking, when she wanted me to come to bed she’d do exactly that. Stretch out her little arm and tap my side of the bed. I just reassured my little cuddle bug that I’ll be up soon so will head up shortly. Is tomorrow Monday already? How come weekends speed by at lightening speed all the time? Oh well, thankful for a quiet day with my girly today. We surprised Grandma and Grandpa by going to their church this morning then after we had lunch together Hannah and I came home and enjoyed the rest of the day just hanging out together. That doesn’t happen often so we sure did enjoy ourselves! Last night was Hannah’s very first soccer ‘game’ ever! SO CUTE!! I love that our local soccer club has a 3yo age group! I’m thankful that Ange mentioned earlier in the spring that she’d signed up Noah. I was able to sign Hannah up in the same time slot and the two of them are having fun playing on the same team. I love the friendship that Hannah shares with each of Ange’s boys!! The season is a short 6 weeks (5 for us as we were on vacation last week) which I think is a great option for 3yo’s. I’ll see where her interest is after this session to see if we sign up again for a full season next year. Rather than playing actual games it’s more of fun skills with the parents participating on the field. Her team started with a fun game of ‘Red Light, Green Light’ and Hannah did SO well! It was fun to watch her and cute when she originally thought that ‘red light’ meant to pick up the ball and run to her coach. Heh! All that running meant a quick water break for our little sprouts. Last night was also picture night. Noah is used to Hannah’s ‘lovings’. The other little guy…not so much! Could these two be any cuter? At 3 I’m sure this will be only one of many of these moments. Maybe she’s dreaming about her first goal? So, Hannah’s first night of soccer was fun plus time spent with a friend! Way to go Hannah!! After a quick 24 hour turnaround at home Hannah and I repacked and headed north for the 2nd week of our holidays. Oh how I’ve enjoyed spending 2 solid weeks with her!!! Unfortunately Dad’s boat is taking it’s annual vacation at the boat repair shop so the only water action it has seen this week was as it was pulled back to the dock. *sigh* The good news is that we thought the motor had seized in it and it was a goner but it doesn’t seem quite that bad and ole ‘Blue Eyes’ may live to ride again. Yay! Thankfully Uncle Scott’s boat is in fine working order and he and Auntie Deb took us for a sunset ride one evening. It was a beautiful calm evening and we thoroughly enjoyed ourselves! We had spent over 3 hours in the lake earlier in the day and as it was now almost 9pm Hannah was fading fast. Dad had gone back and forth all week about what to do about his boat. It’s a lot of work for a short 3 week season at the cottage but he’s really missed it. In past years he’s gotten up early to go fishing and that just didn’t happen this year. Once Scott hit the throttle this is what I saw and I knew Dad wanted to get the boat fixed! Look at that smile of contentment! The girls on the boat. Auntie Deb holding Joey, and my nieces Rebecca and Victoria. Hannah loving the wind in her hair. Thanks Uncle Scott and Auntie Deb! We had a great time!! It was like Christmas in July! We boarded our plane headed east at10:30pm and by 10:35 this was Hannah. As much as lugging the car seat around the airport takes more effort it sure is worth it for us! Our take off was delayed (again) by almost 2 hours and then had a 4 1/2 hour flight to Cleveland. The next time she woke up was as we approached the gate in Cleveland and her first question was, ‘Mommy, when are we going to fly?’ Heh! We had a 3 1/2 hour stopover so it was great to take our time and explore. We’d hoped to meet up with a family whose daughter had shared the same room with Hannah in DaoXian in 2009 but unfortunately strep going through their house nixed that. Hopefully another time! Hannah and I shared a little breakfast together and then she was treated to her very first donut ever. Mmmm! She’s had donut holes in the past but never an entire donut. Oh happy day! She licked off 1/2 the icing and ate only a couple of bites but she was in her glory! It was fun too that she chose one that matched her pj’s! After getting her dressed we headed to our gate. As we waited they made an announcement about the flight being oversold and they were looking for 1 person to offer their seat and they would fly out 7 hours later. I didn’t give it much thought at first as I wasn’t sure how we’d spend another 7 hours in the airport but then I thought about it a little and we decided to go for it! They were offering a $600 travel credit, good for a year and that would pay for about half our flight to California again next summer. This year we’d travelled on air miles and I wasn’t sure how I’d come up with the cash for next year’s flights but now part of the answer was right there in front of us. A quick phone call to Auntie Michelle and Uncle Mark who were picking us up in Toronto and off to the podium we went. I offered our seats and made sure that they had room for the 2 of us on the next flight. Sure enough they did so we did it! We delayed our return in exchange for the $600 credit! Wheee! As we waited for the gate agent to make up the voucher we met a wonderful family who were preparing to go on an Alaskan cruise. Hannah chatted with their ‘kids’ (ages 20, 18 and 14) and ran about a bit (we were in a quiet part of the airport) while I worked with the agent. You can imagine my shock and surprise when she showed up with not one but two travel vouchers, each for $600!! Wheee….we can go back to California next July for sure! M3 was excited to hear the news too so we’ll be headed to California to celebrate the 4th of July with our dear friends once again! Next we set off to explore the airport some more. We found a bookstore and Hannah enjoyed reading here for more than an hour. As much as my girly is go, go, go, I also love that she can sit quietly and get lost in a good book! Our adventure took us up and down elevators and along long concourses and tunnels as we explored what was around. We had also been given lunch and supper vouchers so we found a place to enjoy some lunch. Tower building is always fun! Down for the count. She slept snuggled in her stroller for over 3 hours. I met back up with the family we’d met earlier and snapped this pic with her friend Dan. He was such a sweet guy and she loved teasing him. We also enjoyed giving them our 2nd meal voucher as there was no way we needed any more food. It was fun to share what was shared with us! Hannah woke up just in time for our flight home and our extended stay was deemed a huge success! We’d enjoyed extra time together, read stories and played with some toys and before we knew it it was time to go. Operation ‘Earn Flights for 2013’ was a huge success and our vouchers are tucked safely away at home. We love to travel and spend time with amazing friends but it’s also good to be home! The last time we passed under this sign was when we flew home from China!!! Waiting for our ride. Thanks M&M!! Another successful trip under our travel belts! Thanks for a great visit Salsa Family! Until next year!!! The Big 4th of July Par*tay!